Banker to banker: Rep. Blaine Luetkemeyer (center) chats with ABA Chairman Ken Burgess (left) before a congressional hearing. Bankers across the country participate in advocacy every day, from state legislatures to the halls of Congress. The challenge they face is almost universal: how to explain the business of banking to lawmakers who may not have a clear understanding of how the U.S. financial system works. Of the 535 members of the 115th Congress, just 18 have a background in banking. And on the House Financial Services Committee—one of the largest and most powerful committees in Congress—only a small handful have real-world experience in the financial services sector. That means that the vast majority of people tasked with setting policies that affect consumers, banks and the economy face a steep learning curve when it comes to banking issues. If the problem is too few lawmakers with banking experience, one logical solution is to encourage more bankers to pursue careers in public service. 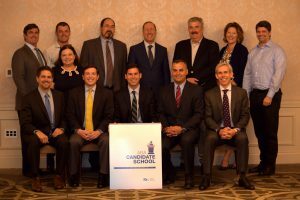 That’s why the American Bankers Association last fall held a candidate school in Washington, D.C., to help bankers from across the country chart their course to elected office. It’s a top priority for ABA President and CEO Rob Nichols, and part of a broader, ongoing initiative to help build up the industry’s political clout. 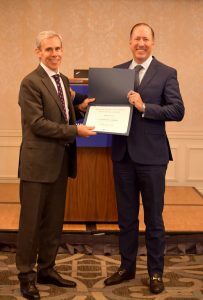 Graduates of ABA’s Candidate School in 2017. Maust and Smerechanskyy were among the inaugural class of bankers that came to the nation’s capital to learn the ins and outs of political campaigning—everything from fundraising to media interviews. The candidates represented diverse backgrounds: Democrats and Republicans from both the coasts and the American heartland. Among them were bank directors, CEOs and branch managers, all united by one common goal: to improve the lives of the men and women living and working in their local communities. John Chrin (left) with ABA’s Rob Nichols. For banker John Chrin, the candidate school provided vital tools and information that he can leverage immediately as a candidate for Pennsylvania’s 17th congressional district. Chrin announced his candidacy in May 2017—a decision he arrived at after nearly eight years of planning, preparation and soul-searching. Chrin is a 20-year veteran of J.P. Morgan Chase, where he was managing director of the bank’s financial institutions group. After seeing the bank through the crisis years—including its successful rescue of Bear Stearns—he left the company in 2009 to teach business and ethics classes at his alma mater, Lehigh University. Chrin is a former bank director for Astoria Financial Corporation (which was recently bought by Sterling Bancorp), and a partner at his wife’s wealth management firm, and he hopes to put his experience to work serving the people of northeastern Pennsylvania. From his time at J.P. Morgan, Chrin has a unique understanding of what works and what doesn’t with respect to regulatory policy. And while he acknowledges that “Dodd-Frank did a lot of good things to stabilize the industry,” he believes that the time has come to rethink some of the bill’s provisions that have proven too burdensome, especially for community banks. Unleashing economic growth and cutting through the regulatory red tape are top priorities for Rep. Blaine Luetkemeyer (R-Mo. ), one of the banking industry’s strongest and most vocal supporters on the House Financial Services Committee. Luetkemeyer came to Congress in 2008 after a 30-year career in banking, finance and insurance. He started out as a state banking examiner for the state of Missouri, and later returned to his hometown of St. Elizabeth to work as a loan officer at the family bank—Bank of St. Elizabeth—which he and his brother still co-own today. 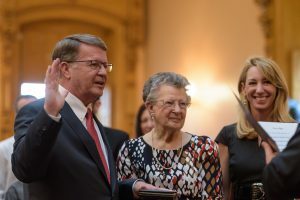 Former ABA Chairman Steve Wilson is sworn in to Ohio’s Senate. Luetkemeyer is a staunch supporter of community banks, using his position on the committee to both advocate for sensible rules and “to thwart bad regulation.” Since taking office, he has championed a number of initiatives supported by ABA, including those to provide regulatory relief from the Dodd-Frank Act for community banks, end Operation Choke Point and adjust the threshold at which banks are designated as systemically important. 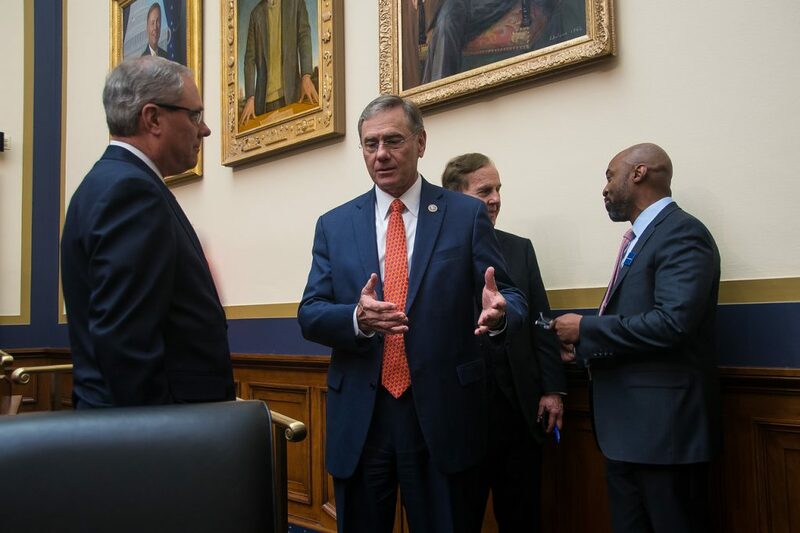 “There’s too much misinformation out there among folks who are making policy about how banks work and about how our regulatory system works,” adds Rep. Steve Stivers (R-Ohio), one of Luetkemeyer’s colleagues on the Financial Services Committee. Stivers—whose career in banking includes a five-year stint at the Ohio Company, a family-owned broker-dealer, and eight years as a commercial and investment banker at BankOne—says that his time as a banker prepared him to serve in elected office, first as an Ohio state senator and later in Congress. While bankers bring many strengths to the table as candidates, however, Stivers acknowledges that the industry hasn’t always enjoyed a positive reputation with voters. When he tried for his congressional seat for the first time in 2008 on the tails of the financial crisis, Democratic challenger Mary Jo Kilroy “ran ads that made people think I singlehandedly caused the financial crisis because I was a banker,” he recalls. While adding that “I think, ultimately, people didn’t believe that,” he lost that race by a narrow margin, but returned two years later to challenge Kilroy again. This time, Stivers won handily, with 54.7 percent of the popular vote. Rep. French Hill (center) speaks to a group of bankers from Arkansas. Another advantage that comes from being a banker? They are already known in their communities as agents of positive change. “Bankers—particularly community bankers—are very civic and community minded. 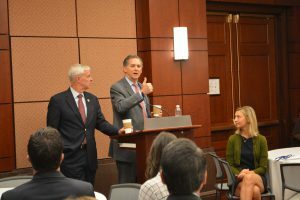 They are very involved with their nonprofits, with their faith-based sector, service sector and their local government officials,” says Rep. French Hill (R-Ark. ), who notes that his track record as a community banker and leader resonated with voters on the campaign trail when he ran for Congress in 2014. The son and grandson of bankers, Hill began his 35-year banking career working for his family’s brokerage business during high school. He went on to hone his economic and business acumen working for First National Bank in Dallas in the early 1980s, and it was there that he also got a taste for politics. At a time when branch banking was restricted in Texas, Hill was tapped by First National’s CEO to help advocate for changes to state banking laws to allow banks to operate ATM machines around their branches, enabling them to better serve their customers. The effort was successful, and a year later, when John Tower—then a Republican senator from Texas—needed a banking policy staffer, Hill’s name came up. From then on, Hill’s professional life was spent in both public service and private enterprise; he served in the George H.W. Bush administration as deputy assistant secretary of the Treasury, and later as executive secretary of the president’s Economic Policy Council before returning to Little Rock to be a community banker. In 1999, Hill and a group of local investors founded Delta Trust & Banking Corp., where he served as CEO for the next 15 years. Now in his second term in office, Hill uses his wealth of business and banking knowledge to advocate for policies that can help bankers get back to what they do best: investing in their local communities. “The most rewarding part, for me, has been being able to take my 35 years of economic policy and financial experience and make a contribution to the debates and to the bills we’ve passed in the House and the laws we’ve enacted in the last three years I’ve been here,” Hill says. Running for office is a life-changing decision that requires planning, preparation and, importantly, timing. 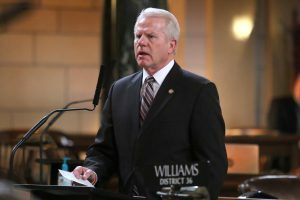 Matt Williams speaks on the floor of Nebraska’s legislature. For banker Matt Williams—former ABA chairman and former CEO of Gothenburg State Bank in Gothenburg, Nebraska—the right time came in 2013, when a seat opened up in the Nebraska state legislature. Williams had just finished his tenure as ABA chairman, and his bank had a strong management team in place that was ready to step up and take over day-to-day operations, leaving him free to pursue a run for state senator. 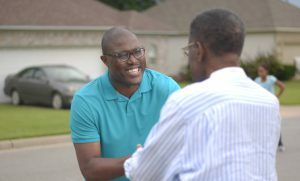 As Williams hit the campaign trail, he recalls how friends and fellow bankers rallied around him, offering not just financial support but boots on the ground to put up yard signs and help spread the word. “I would definitely encourage bankers to be involved in the political system and increase their involvement as they are able,” says Steve Wilson, another former ABA chairman who in 2017 was tapped to fill a vacancy in the Ohio state senate. A good place for prospective candidates to start, he says, is to get involved with their local political parties to make connections and start garnering support. Frank Scott is exploring a run for mayor of Little Rock. It’s also important to stay in tune with the needs and priorities of the local community. “As a candidate, you want to make sure you stay close to the people,” says Frank Scott, vice president at First Security Bank in Little Rock, Arkansas, who recently announced his intention to run for mayor of Arkansas’ capital.